There may be several different reasons why you want to read this book. Perhaps you are currently experiencing a performance issue with an application. Or, you may be designing and developing a new application that you want to deploy on the IBM WebSphere Application Server running on the IBM eServer iSeries server. 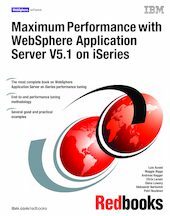 This IBM Redbooks publication helps you to gain a solid understanding of the factors that can affect the performance of the Java and WebSphere applications running on the iSeries server. As a deployment platform, the iSeries architecture combined with Java and the WebSphere Application Server provides a robust execution environment, which is ideal for the mission-critical business applications and Web sites. This book explains how to tune the iSeries server for IBM WebSphere Application Server. The book is divided into several logical tuning tasks, such as tuning the Java virtual machine. You can study each of these logical blocks and apply them independently from other tasks. But, to achieve optimum performance on the system, we recommend that you use the systematic approach that is shown in this book. This book is written for the system administrators, application developers, and I/T consultants who are already familiar with WebSphere Application Server and work management topics for the iSeries server.